Description: This class assumes that the student is proficient in cutting jump rings, opening/closing jump rings, and linking the rings into chains. The class will introduce the student to such advanced techniques as non-round jump ring shapes, jump rings made from different wire shapes, beaded enhancements, mixed metals, dangles, drapes, and many other enhancement techniques that can be applied to traditional designs to make them very unique. We will also examine some more complicated patterns and learn approaches to doing them which make the process much easier. The class will consist of one pre-selected project utilizing non-round jump rings followed by other projects which each student can individually select. The class notes will present many different suggestions for projects that feature the techniques that are presented in the class. Each student will complete a minimum of 4 projects. Materials: Students are encouraged to bring their own sterling silver wire and clasps. Wire, beads, crystals, and findings will be available from the instructor for students who do not have their own. 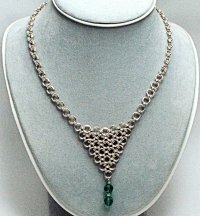 Prerequisite: Chain- Maille’ Jewelry (Beginning) This class requires completion of the Beginning Chain-Maille’class. Please do not sign up for this class until you have COMPLETED the Beginning class.